Being very right-brained, my creativity is always trying to find different ways to manifest itself. I recently started wire wrapping crystals as a way to create both an outlet for my creativity, and an easy way to keep my crystals with me that does not involve carrying them around (I tend to forget they are in my pockets!). My problem with wrapping is that I've developed an addiction and can not stop! I love to wrap, I just don't have places to keep all the crystals that come from this urge to create. Some go on necklaces, some become charms on bracelets, but even still, a girl can only wear so much jewelry at once. I needed to come up with something else to do with all these crystals which kept finding their way into my life. In our warehouse, we have been collecting these little metal rings (they keep the necklaces from tangling in shipping) with the idea that there had to be something we could do with them in the future. I was fascinated with them, and immediately began stringing them into chains, unsure of where to go from there. As I resumed wrapping stones that I had nowhere to keep, it occurred to me that they fit nicely over these little rings we had been collecting. I strung the wraps onto the chain, simply intending to keep them off of my desk, thus, out of the way, not realizing that I was creating something new in the process. It took another set of eyes to realize that the combination of materials we had lying around was actually a fascinating piece in itself, and I had, perhaps, inadvertently created a new way of keeping ones crystals! This opens up many possibilities for all of us, as working with found materials can be easy and inexpensive. Perhaps you have things lying around that you knew would be useful one day that you've forgotten about? Any of these things bring potential for projects of your own! I was able to use these rings that someone else would have been dismissed as packaging, and probably thrown out. You could use anything similar (key rings perhaps?) to create a project like this one, to hang anywhere in your house. 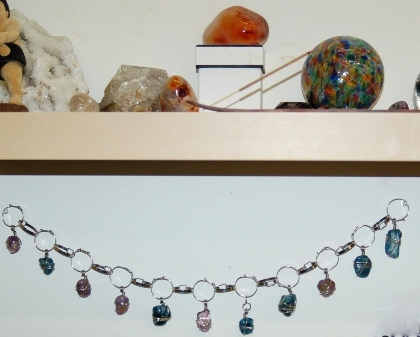 I plan to make another to hang over my bed, it will keep my crystals near me while I sleep, without the danger of me rolling over onto them (ouch! ), or having them take up much needed space on my bed-side table. I also became addicted after I started wrapping Crystals. I think it has to do with the joy and the energy of the crystals. I now have a surplus of crystal neclaces. Then, since as you expressed there is only so many places on the body, I started with earrings. Next will be bracelts. Yip, yip, hurray to positive addictions!